There is a small select group of footballers who play their whole careers for the one club. Even fewer of these players become recognised as legends of the game. Franco Baresi, Tony Adams, Paolo Maldini, Tony McDonnell; the greats. But one player who is not as well known, who joins these players as not only a one-club man but also a footballing legend, is arguably Asia’s greatest ever footballing son. Growing up with a football manager as a father, Majed Abdullah was subject to the beautiful game from a very early age. As a child, Abdullah played for the “Al-Jazaeria Elementary School” football team. Originally he was a goalkeeper, but like many young children he soon found out that he was far more suited for another position. Abdullah had to find this out when the main striker for his team was unable to play, so he was named up front instead, where he inspired his team to a 3-1 victory. 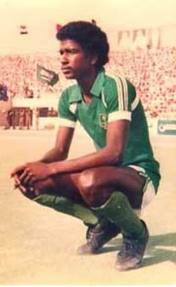 Majed Abdullah joined Saudi Arabian club Al-Nassr as a 15 year old and trained in the youth teams there for two years before making his breakthrough into the senior team in 1977. In his maiden season with the first team, the 17 year old Majed started most games on the bench. But when first choice striker Mohammed Saad Al-Abdali got injured towards the end of the campaign, Abdullah was given the chance to start the last four games of the season. Abdullah stunned all by scoring four goals in these final four games. The teenager had very much so arrived on the scene. The Arabian Pelé was selected to play for the Saudi Arabia under 17s team in a tournament called the Tabriz Championship in Iran. In three games that he played here, he scored an impressive 7 goals, showing the world he was a natural goalscorer. Two of his goals he scored against hosts Iran, two more against Bulgaria, and he topped the tournament off with a hat-trick against Russia. In Saudi Arabia, Al Nassr, founded in 1955, are known as “the club of poverty” due to their lack of honours and trophies. Before 1977, they had won no Saudi Premier League titles, two Saudi King’s Cups and two Crown Prince Cups. When Majed Abdullah left them in 1998, he left a club that had won five League titles, six King’s Cups, three Crown Cups, two Saudi Federation Cups, one Asian Cup Winner’s Cup, one Asian Super Cup, and two Gulf Club Championships. To put that in better context, the Al Nassr had won 4 honours before Majed Abdullah (all national), and 19 honours by the time he parted company with them, nearly five times the amount of its previous history. Proving that Al Nassr’s success perfectly coincided with Majed as a player at the club, in the thirteen years between when Abdullah left Al Nassr and now, the team have only won one single trophy – three years ago they won the Saudi Federation Cup; which isn’t regarded as a highly important trophy in Saudi football. At one stage, the Federation Cup was an under-23s tournament, but interest had waned so much that they opened the competition to all ages again afterwards. Al Nassr’s legendary Number 9 left his mark on the club in a massive way. On his way into turning them into a title-winning team, despite their success coming only with Abdullah as a player, Majed scored an incredible 320 goals for his “The Global Club”. These goals came after a 21 year career with 467 appearances. On six occasions, Majed was the league’s top goalscorer. The Desert Pelé also showcased his talents well on the international stage, although it took a long time for his efforts to come to fruition for the Saudi Arabia national team. In 1994, the Green Falcons qualified for their first ever world cup finals in the USA. Majed helped them reach the last 16, before eventually losing to Sweden, who finished the tournament in third place. Abdullah retired from international football in 1994. At the time of his retirement, he was the record holder for most international caps, with a total of 139 games for Saudi Arabia under his belt. In these record-breaking 139 games, he scored 89 goals for his country. 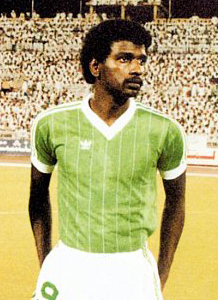 In the pinnacle of his career, Majed Abdullah was named as Asian Player of The Year three years in a row from 84-86, inclusively. In a survey done by the Al-Jazeera Channel, he was also named as Asian Player of the Century. Majed Abdullah had a glittering career. He turned his club from the laughing stock of the league into six-time title winners. He broke many records and many believe him to be Saudi Arabia and Asia’s greatest footballer in history. Majed Abdullah (legend of asia) ..
Al Nassr are known as (The Global) not (the club of poverty) !! ..
Al Nassr won the league 15 times how to be the laughing stock of the league ?!! ..